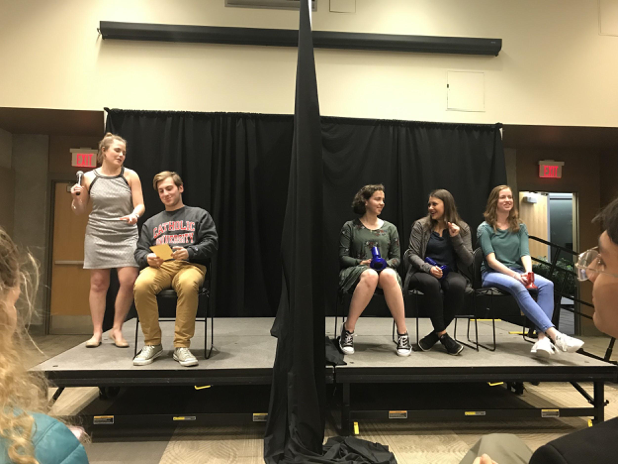 On Monday night Campus Ministry hosted its annual Dating Game, with special appearances from Catholic University’s PEERS— Peer Educators Empowering Respectful Students, an organization devoted to addressing the sensitive issues that college students face today. The Dating Game was held in the Pryzbyla Center and was marketed towards freshmen students looking to form new and healthy relationships. Upon arrival, students were given the opportunity to participate as a contestant on the game show. Audience members were given bingo cards to be filled out by their peers and the first person to fill the card completely was awarded the first place in line to dinner catered by Maggiano’s. The event started when the first three girls were selected from the individuals who volunteered at the beginning of the evening and were introduced to the audience. Then the bachelor was brought out from the back of the room, blindfolded, to keep the identity of his three potential dates secret. The bachelor sat on one side of a curtain, and his three potential dates on the other. He then selected three questions to ask the girls. The candidates responded by speaking through a plastic voice changer. At the end of the three questions, the bachelor chose the girl he wanted to take on the date based on her answers. This process continued six times throughout the night, alternating between three girls and one guy or three guys and one girl. The dates ranged from tickets to a Wizards basketball game to dinner cooked and served by campus ministers. Between the rounds of The Dating Game, members from PEERS played games with the audience as a way to educate them about healthy relationships, as February is Healthy Relationship Month. Participants won prizes if they answered the questions about healthy vs unhealthy relationships correctly. DPS in Leahy is also a resource for these situations and the victim has the option to open a formal investigation into the incident. PEERS will also be hosting an event called “Can I Kiss You?” with guest speaker Mike Domitrz from the Date Safe Project on Monday, February 11 at 7pm in Pryz Great Rooms, as a way to celebrate healthy relationships and emphasize the importance of communication in any relationship.